THE FLOW OF AIR IN AND OUT OF THE ALVEOLI IS CALLED VENTILATION AND HAS TWO STAGES: iNSPIRATION (FOR INHALATION) AND EXPIRATION (FOR EXHALATION). TO ACCOMPLISH THIS, THE WHOLE THORAX MOVES AND AND CHANGES SIZE, DUE TO THE ACTION OF TWO SETS OF MUSCLES: THE INTERCOSTAL MUSCLES AND THE DIAPHRAGM. THESE ARE THE MUSCLES THAT ARE STRENGTHENED BY USING THE EXPAND-A-LUNG BREATHING FITNESS EXERCISER. IN ESSENCE, YOU INHALE MORE OXYGEN, AND EXHALE MORE CARBON DIOXIDE. THE RESULT IS A SUBSTANTIAL IMPROVEMENT IN SHORTNESS OF BREATH AND ENDURANCE, THROUGH BETTER BREATHING. ALL IS DONE NATURALLY, WITH THE HELP OF THE EXPAND-A-LUNG BREATHING FITNESS EXERCISER! 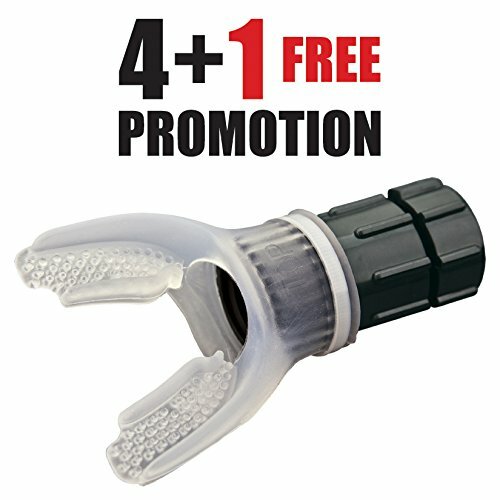 "BUY 4 GET 1 FREE PROMOTION" THIS IS OUR BEST VALUE ($23.96 ea.) - IDEAL FOR TEAMS AND GIFTS!!! BUY DIRECT FROM THE MANUFACTURER & SAVE!!! - "MADE IN USA" - FREE SHIPPING + FREE MANUFACTURER'S 5 YEAR FULL WARRANTY + 100% MONEY BACK GUARANTEE IF RETURNED WITHIN 60 DAYS. If you have any questions about this product by Expand-A-Lung, contact us by completing and submitting the form below. If you are looking for a specif part number, please include it with your message.